19 years old. A small town kid. Many in this nation wonder where we are headed, and despair of our future when they read of the problems facing our youth. If Andrew was any sort of representation of America’s youth, then I’d say the nation will be in good hands. My son joined the Army in part as a tribute to his friend, to help finish the work that Andrew was a part of. I think that that is as good a reason as any for serving. It shows the respect others had for this young man. In support of that assertion, I post below the Presidential Citation which accompanied Andrew’s Silver Star. Read it through, and then visit his FaceBook memorial and look at the pictures. God Bless them all. The President of the United States takes pride in presenting the Silver Star Medal (Posthumously) to Andrew R. Small, Private First Class, U.S. Army, for conspicuous gallantry and intrepidity in action while serving with Company B, 1st Battalion, 32d Infantry Regiment, 3d Brigade Combat Team, 10th Mountain Division, during combat operations in support of Operation ENDURING FREEDOM, in Afghanistan, on 11 August 2006. On that date, Private First Class Small was attached to the lead element of a 22-man platoon on patrol in the mountains of Nuristan, Afghanistan. Three hours into the patrol, the enemy ambushed the Americans, waiting until the patrol’s point man had passed their concealed position before opening fire. The attack caught the entire lead group in the kill zone. Three Americans were killed immediately and the remainder of the platoon was pinned down under enemy fire. Private First Class Small was located as the sixth man in movement in an extremely tight trail. During the initial fire, he and the rest of the squad were pinned down by accurate small arms fire. The only cover available was to hug the side of the mountain, which did not allow his squad to return fire. His team leader, Sergeant Smallwood, was then hit by an RPG, which seriously wounded him and left him exposed to enemy fire. Private First Class Small exposed himself and laid down suppressive fire against the well-fortified enemy position. By doing this, he drew fire to his own position, but he refused to seek cover. The action allowed his team leader to drag himself over a cliff to cover. At this time, the enemy launched another barrage of rocket propelled grenades into Private First Class Small’s position. This volley severely injured two soldiers who later succumbed to their wounds and struck Private First Class Small in the back by shrapnel. Even though Private First Class Small was wounded he got back up and continued to lay down suppressive fire, refusing to seek cover or medical aid until he was able to facilitate the maneuver of his squad out of the kill zone. Private First Class Small continued to engage and be engaged by the enemy who outnumbered him by seven to one. This allowed the rest of the platoon and close air support to suppress and kill the enemy. When the patrol leader was able to move up to Private First Class Small’s position, he found him lying in the trails, weapon in his hands, orientated toward the enemy and out of ammunition. Private First Class Small’s sacrifice directly saved the lives of three other squad members and denied the enemy an opportunity to pursue its advantage over the pinned down Americans and declares that his sacrifice was the most significant reason members of the squad were able to survive the ambush attack. Ahhh… how tragic. Thank you for bringing to our attention one of our fallen warriors. It’s sobering. May his memory live on. As always, thanks to you and your son for serving. Agreed, Thank You, PFC Small, and Thank You, Kindred Family. Tim, his Dad, and his son. It’s all good, Scott. We each do our part. You also serve, by taking the watch at home, at night, to protect and serve. There are sheep, and there are sheep dogs. Thank God we have the latter. PFC Small is an American hero; may God grant him peace and rest. Thank you, PFC Small, and all who serve. As the daughter of a WWII and Korea vet and 26 year member of the USAF, and the mother of an Army tanker (Kosovo service), I know the country does not do enough to honor these brave men and women of the US Armed Forces, but those same self-sacrificing men and women don’t complain; and that’s not why they serve. *Thank you,* for the courage to write of PFC Small. I see *Honor and Courage* in both PFC Small *AND* AW1 Tim. I see courage in AW1 Tim sharing the story of PFC Andrew Small and adding it to the large mosaic we call history. It would be so easy to stay silent, it would not just be a loss to the family and friends. This also would not just be loss to us or even the Nation. The major loss would be to the honor of the US Military, “Leave no Soldier behind!” It would be so easy to want to move on with your life, there are many things you want to forget. But, you absolutely refused to leave PFC Andrew Small behind. Thank you! One more soldier who now guards heavens gates. I salute you AW1 for honoring the memory of this young man who was a friend of your sons and by extension you. I salute your son for honoring his memory by serving in his stead in our countries Armed Forces. It is an honor to read such stories as you have posted here even though it is a tragic ending to such a young life. You are a hero and one of the finest of our great nation. I am humbled by the courage and honor of the fighting men and women who guard our nation. 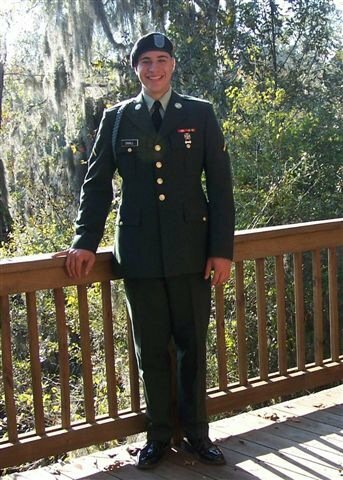 May God Bless You PFC Andrew Small, and offer comfort to your family. God bless him. He’s the best this nation has to offer. If we live decent-enough lives, we’ll see him in Heaven when our times come. Gratitude is in the heart’s memory. I have no doubt PFC Andrew Small will live on in the hearts of many. Thank you for sharing his story with us. Every time I read one of these I get tears in my eyes and resolve in my heart to not let their sacrifices be in vain. I salute him. And your son. PFC Small was a good man, and brave. He jumped into the fight and fought to the end, willingly sacrificing himself to kill the enemy and to save his friends. He knew what he was doing, and did it anyway. This is a man whose story I tell my sons, and I hope they will tell their sons. Maine is proud to have borne him. May God bless him and all of his loved ones as the fourth anniversary of his heroic deeds approaches.